Pharaohs Kingdom Scratch Card Review - Casino Answers! 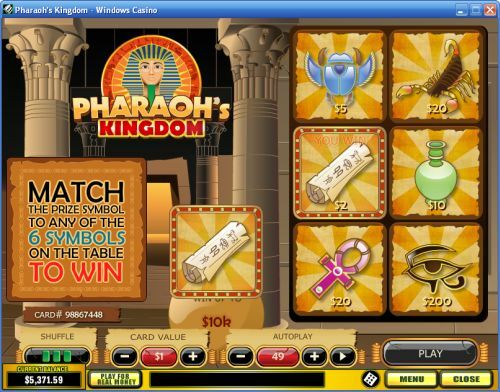 Pharaoh’s Kingdom is an online scratch card developed by Playtech. You can play the Pharaoh’s Kingdom instant win scratch card game at Bovada. Card values on the Pharaoh’s Kingdom scratchie are $0.10, $0.20, $0.30, $0.40, $0.50, $0.75, $1, $2, $3, $4, $5, $10, $15, $20, $25, $50, $75 and $100 per game. Pharaoh’s Kingdom has a great betting range that is suitable for casual players as well as high rollers. To play the Pharaoh’s Kingdom instant win scratch card, you must select your bet and press the “Play” button. From there, you will be given a symbol. You must scratch all 6 panels to match the symbol. If you find a match, you will win the prize listed below the symbol. You only need to match one of the symbols on the table to the prize symbol to win a prize. You can scratch the entire table quickly by using the “Scratch All” button. You can win up to $1,000,000 on the Pharaoh’s Kingdom scratch card by betting $100 per game. When betting $1 per game, you can win up to $10,000. You can win a lot of cash by playing the Pharaoh’s Kingdom scratch card lottery game at Bovada! Pharaoh’s Kingdom features an autoplay mode. Under “Autoplay,” use the “+” and “-” buttons to select up to 99 autoplay games. To begin the autoplay mode, press the Play symbol. You can stop autoplay at any time on Pharaoh’s Kingdom by pressing the Stop symbol. Pharaoh’s Kingdom has a great theme. The Egyptian theme is very popular at online casinos and when given the type of presentation that Playtech has given to the Pharaoh’s Kingdom scratch card, we can certainly see why. Pharaoh’s Kingdom also gives players a wide variety of available bets and prizes, so you can bet exactly what you want to. To play the Pharaoh’s Kingdom scratch card, sign up and make a deposit at Bovada! If I’m from the United States, can I play the Pharaoh’s Kingdom scratchie? No, American players are unable to play the Pharaoh’s Kingdom scratch ticket at this time for real money. For a great selection of USA-friendly scratch cards, please visit Bovada. Where can I play a flash game of the Pharaoh’s Kingdom card? You can play the Pharaoh’s Kingdom instant win scratch card game in your browser at Jackpot Scratch Casino. You can play for free or play for real money. If you experience any difficulties with the Flash scratch card game, make sure you have the newest version of Adobe Flash Player.